We get a lot of printers coming through our shop. Some of them come in with scuff and tape marks. 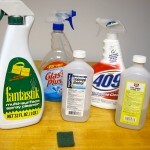 First I use a household cleaner like Fantastik, Windex, or 409. Many case this does the job. Third, if the stain is still not going away, I use Ethyl Rubbing Alcohol which is more intense. 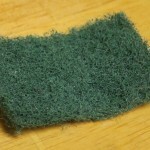 Forth, when push comes to shove, with care, I use a green Scotch Brite pad. I use this sparingly along with a dab of Isopropyl alcohol. Warning, use these cleaning methods sparingly and you may want to test the back of your printer first to make some the cleaner is safe. Finally, if the discorloration on your printer came from exposure to sunlight, this can not be cleaned away.